The ZEW experts continue to mark up their perceptions growth. Today the IMF did the same, releasing a forecast for global growth that was higher by than 0.2 percentage points than the outlook it released in October. The IMF puts more of the improvement for the outlook in the camp of the developing economies which is exactly where the ZEW survey focuses. The ZEW survey produces some outlook estimates for the EMU, the U.S., the U.K. and Japan as well as for the three largest EMU economies separately: Germany, France and Italy. Over the past 12 months, the median improvement in the economic situation diffusion index from ZEW is 57.5 points; that is a stunning gain. The average gain (is 44.1 points) I engage in some 'double counting' here as I average all the ZEW observations for the EMU, Germany, France, Italy, the U.S., the U.K. and Japan which gives some double counting to Germany, France and Italy as they are also embedded in the EMU measure. Still, the thing that causes the average and median statistics to be so different over 12 months is the U.K. Over 12 months the UK change is only +2.1. but over three months and one month, the U.K. outlook is improving as much as any other country/region in the table. In absolute terms, Italy has the worst output at a -10.5 reading and the U.K. is next at -2.4. But both of them are substantially stronger than their respective 12-month ago values (note: these are not the differences with the 12-month column in the table which is a 12-month average). Still, back to January 1999, the euro area, Germany, the U.S., Japan, France and Italy all have raw diffusion standings above their respective 83rd percentiles (some by quite a lot); only the U.K. is moderate with a 52nd percentile standing. In summary, the ZEW financial experts see a great deal of progress as having been made over the past year in the economic situation. Interestingly, the outlook has not changed by nearly as much as has the perception of the current situation. 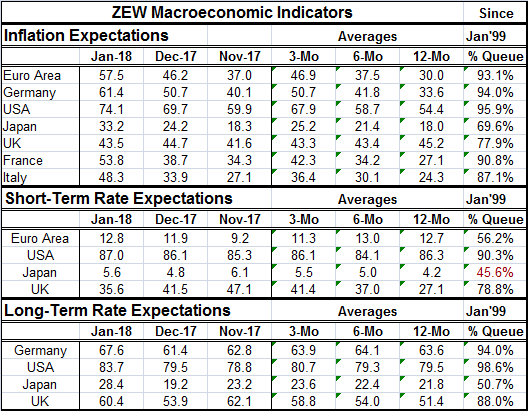 While the current situation ranks are for the most part above their respective 83rd percentiles, it may be surprising to note that expectations, despite optimism in the U.S. about recent economic performance, do not hit high notes in the ZEW survey. 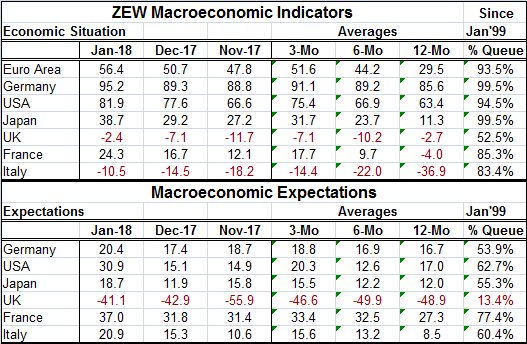 The macroeconomic expectations of ZEW experts are lower in January 2018 than they were in January 2017 by nearly 15 points for the EMU and 10 points for the U.S. The U.K. outlook is little-changed. Expectations generally are up 3.5 to 7 points for the group over 12 months (median vs. average changes) and over three months they are up 11 to 12 points. Over one month they are up by 5 to 6 diffusion points. The U.S. still has the second strongest queue expectation standing at 62.7%, second only to France at 77.4% and just ahead of Italy at 60.4%. The U.K. standing is irreparably low even though the U.K. economy continues to perform quite well. Today the U.K. reported an extremely low fiscal deficit for December and still cheery expectations by U.K. manufacturers. ZEW experts apparently think that there is a much sharper Brexit sting out there waiting to happen. Moreover, the ZEW assessment of the US picked up dramatically in January compared to December as the U.K. diffusion reading doubled. All survey participants saw substantial gains in the month except Germany and the U.K. This brings us to inflation expectations. Inflation expectations produce some curious results because the ZEW experts one year ago were still looking for hopped up inflation and that outlook was substantially reset lower around March and April. It has sense been restarted higher. This is just another reminder how inflation expectations have risen and fallen almost like the tides. Inflation is gradually creeping back up -- there is no denying that. But it is only creeping up toward its target which it has been below for a very long time. While all countries in the table have ZEW member inflation expectations lower in January 2018 than they were in January 2017, all are looking at substantial increases in inflation expectations over the past three months (except the U.K.). In the past month inflation expectations are up sharply in the EMU and in each individual EMU member listed in the table as well as in Japan (good news!). But the gain in the U.S. is more modest and in the U.K. expectations are being pushed back down. Even with all that shifting, the queue standing for inflation expectations is relatively high everywhere and importantly it has even risen in Japan. Of course, there is also some correlation here with oil prices that have risen. We have a separate 'clean' series in the U.S. from the University of Michigan on inflation expectations for one year out and five years out with the two surveys taken at the same time over the same group of people. One thing we learn from that survey is that oil prices do affect inflation expectations for one year ahead but have little or no impact out over five years. The ZEW expectations are for six months ahead. Short-term interest rate expectations line up more or less as you would expect in the survey. In the U.S., the Fed has been hiking rates since end-2015 and it has guidance calling for higher rates over the next several years. The ZEW expectations for the U.S. - at its 90th queue percentile - might be expected to be even higher in this situation. In Europe, the outlook for higher short-term rates is just about a coin toss with a 56th percentile standing. In Japan, it is coin toss as well but slightly on the other side of 50%. That is a bit surprising as the Bank of Japan is making no noises about less accommodation but the European Central Bank does have plans to begin withdrawing accommodation. In the U.K., the Bank of England has begun to tighten but the rate hike expectations of the ZEW members have actually settled lower in the past few months. When a central bank tightens, the yield curve flattens; that is a reason to be relatively more surprised that long-term rate rise expectations are even at a higher relative standing than for short-term rates in the U.S. Typically, the long-term rates rise faster than short-term rates if/when the central bank is 'behind the curve' in tightening. So such a development in the EMU would make sense and we observe that for German long-term rates vs. EMU short-term rates. For Japan, long-term rates are still a coin toss. In the U.K., long-term rates are seen rising broadly and have a queue standing a bit higher than for short-term rates. The U.S. result with a higher queue standing for long-term rates than for short-term rates is curious given the persistent nature of the Fed's guidance and the ongoing tranquility of actual inflation and of wages in the U.S.
On balance, the ZEW experts seem to have a case of the yips on inflation again. Extrapolating from their own responses, it is current conditions that have changed the most and so I would regard the expectation on inflation as boosted by essentially a Keynesian view that there is less slack. It is not so much due to the outlook which is not that much changed. ZEW experts have high readings for inflation expectations up and down the line (on data since January 1999). Curiously, for the U.S., in the University of Michigan poll for inflation prospects five years ahead, we get a reading that has been lower on the order of 5% or 2% of the time (depending on the exact measure). The U.S. year-ahead inflation expectation in the poll is slightly higher but still very well contained (inflation is lower 25% to 33% to 45% of the time depending on the exact year-ahead measure) -- nothing like 96%. We seem to live in a world of inflation pessimism. Keynesians continue to believe what they always have believed and set the persistent new contrary observations to one side, like your younger brother who does not want to eat his vegetables. Yet, the Phillips curve remains seriously flawed and shows no signs of life. Market participants seem to treat it like a vampire that might pull stake out of its own heart and spring to life again. All this angst in markets is cheering or urging central banks to stronger action, action that might not be required. In the U.S., two Fed district bank presidents have been relatively outspoken on how monetary policy should be a bit more skeptical on inflation instead of willing to trust its forecasts going ahead; those members are James Bullard in St. Louis and Charles Evans in Chicago. Of course, what we have here are surveys of German financial experts. And we know that Germans hate inflation with a vengeance. But the ECB has to make policy for all of the EMU. And while a German economy and audience might be forgiving of an overly strict tightening and forgiving if higher rates were to overstay their welcome, the rest of the EMU is not like that. This potential trade-off is made worse by the fact that the German economy is more advanced in this cycle than the rest of the EMU and faces less slack and potentially more inflation pressures that the rest of the EMU- a very unusual development. No doubt that if the Bundesbank were still running German monetary policy independently rates would have been going up for some time now. But it isn't and they aren't.